Purchased at the Gold Coast Magic Millions Sale for $32,000, from the family of Champion Mare Jezzabeel. Bred to stay. Enquiries please phone Trevor 0418947987. YOUR SONG (AUS) (Brown 2009-Stud 2013). 3 wins-2 at 2-to 1400m, BRC BTC Cup, Gr.1. Half-brother to the dam of SP Wimbledon. Sire of 74 rnrs, 35 wnrs, inc. SW Split Lip (SAJC Dequetteville S., L), SP Brave Song, Memento, Soundcheck, Peristrophe and of Only Wanna Sing, Bold Kingston, Miss Exfactor, Mister Songman, Setoga, Tabbing, Devolving, Envy of All, French Tune, Girl in a Million, Songlike, Cedarwood, Intothelimelight, Jolie Rose, etc. His oldest progeny are 3YOs. BROADWAY AND FIFTH, by Street Sense. Unraced. Half-sister to Eighth Wonder (dam of RACING EIGHT - WONDER MOSSMAN (MAC.)). Dam of one named foal. Scotland the Brave. 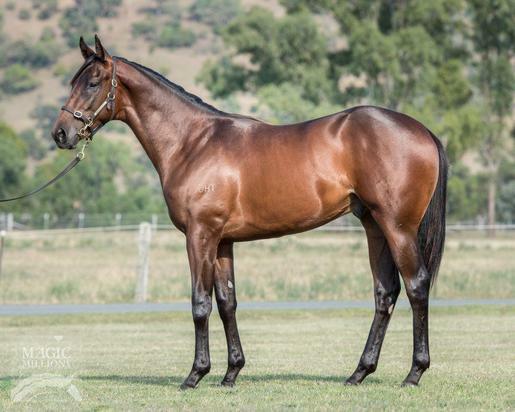 2 wins at 1900m, 2200m, WATC Magic Millions Moment of Change H., 3d WATC Tabtouch.mobi H.
Faustus (More Than Ready). 3 wins-1 at 2-from 1100m to 1600m, A$185,345, to 2016-17, ATC Nova 969 Fitzy & Wippa 2YO H., 2d Canberra RC Black Opal S., L, ATC Killa Burger Gril H., 3d Scone RC Turangga Farm H.
Jezadane. 2 wins at 1300m, 2050m in Aust. Sire. RACING EIGHT - WONDER MOSSMAN (Mac.) (Mossman). Horse of the Year in Macau in 2013-14 & 2014-15. 18 wins from 1200m to 1800m to 2017-18 in Aust. and Macau, Macau Gold Cup, L-3 times, Macau Star of the Sand S., L, Winter Trophy, L, Sand Specialist S., L, Directors' Cup, L-twice, Spring Trophy, L, Duque de Caxias H., ATC Membership P., Macau Dortmund H., Korea Racing Authority Goodwill Trophy, Ballymoss H., Avondale H., Makati H., 2d Macau Star of the Sand S., L, Directors' Cup, L-twice, 3d Macau Derby, L, Macau Star of the Sand S., L, 4th Macau Gold Cup, L, Macau Sprint Trophy, L-twice. Octuplets. Winner at 1400m in 2016-17, 3d MRC Thebigscreencompany.com H.
Lucky Edie (Swiss Ace). 3 wins-1 at 2-to 1400m, Waikato RC Jorja's 12th Birthday H., 3d Wanganui Guineas, L, 4th Levin RC Ryder S., L.
Poster Girl. 3 wins at 1200m, 1400m, Otaki Maori RC Riverstone Cafe H.
Marmalady (Duke of Marmalade). 5 wins from 1600m to 2600m, R488,800, Turffontein Premier Racing S., 2d Turffontein Yellowwood H., Gr.3, Durbanville Thank You for Your Support H., Turffontein Racing. It's a Rush S., Season's Greetings S., 3d Turffontein Caradoc Gold Cup, Gr.3, Spook Express H., L, Aquanaut H., L, 4th Turffontein Gerald Rosenberg S., Gr.2. Frank Heavens. 4 wins from 1550m to 2200m, SAJC Melbourne Cup Live at Morphettville P., 2d SAJC Holdfast Insurance Brokers 2YO H.
JEZABEEL (Zabeel). 7 wins. See above. ASHLEY GROVE (Kaapstad). 3 wins-1 at 2-from 1200m to 2400m, A$137,165, Tasmanian Derby, Gr.3, VATC James Grice H., 2d VRC St Leger, Gr.3, MVRC Victorian Jockeys Association H., SAJC Barmax H., 3d VATC Glenfern Welter H., John C Reilly H.
RASMUSSEN (Flying Spur). 10 wins to 1350m, A$385,842, QTC Ascot H., L, BRC Superior Pak H., BTC FBAA National President H., Qld Tatt's RC Sky Channel H., BRC Paul Crooks Advertising H., BTC B Magazine H., Lexus RX350 H., QTC CPX Printing & Logistics H., 2d QTC Cup, Gr.2, QTC Bribie H., L, BRC Urban Brisbane Quality H., Zig Zag Foundation H., QTC Tooheys New H, Chime Zam P., 3d BRC Hotel Grand Yearlings at Magic Millions H., Cranbourne TC Frankston Cup, 4th GCTC Prime Minister's Cup, L.
Valmiera (Val Royal). 3 wins from 1200m to 1600m, TTC Cripps Nu-Bake H., 2d TRC Elwick S., L. Producer.